TOKYO/UWAJIMA, EHIME PREF. 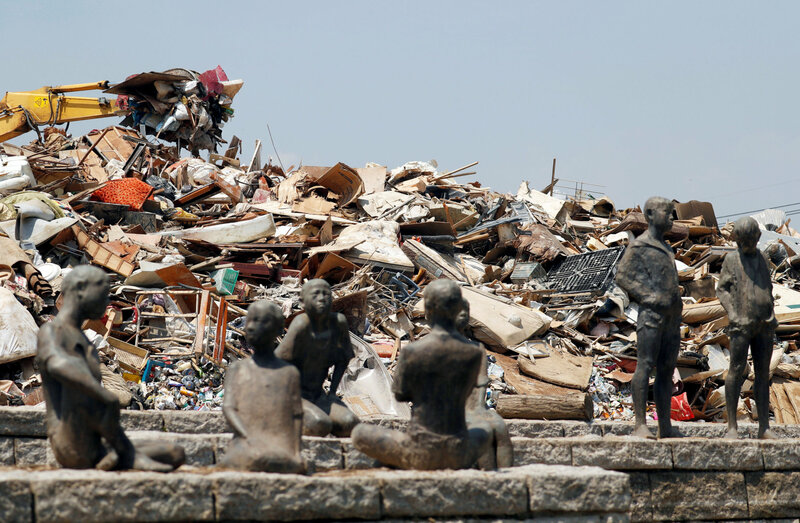 - The government plans to designate the torrential rain that wreaked havoc in western Japan as a disaster of extreme severity so subsidies for reconstruction projects in the affected areas can be increased, it was learned Sunday. The government is trying to expedite the Cabinet decision on the designation while trying to get a full picture of damage from the rain, which triggered floods and hundreds of landslides, officials said. The disaster will be the first to receive such status since the government improved the extremely severe disaster designation system in December. Previously, it could take several months for a designation to be made. But the government is now allowed to announce the prospects for such a designation as early as about a week after the damage investigation begins. The change was made to facilitate reconstruction efforts so disaster victims can rebound faster. “We’ll make our best efforts so that governments in areas stricken by the torrential rain can promote reconstruction projects quickly without worry about financial costs and afflicted residents can rebuild their lives as early as possible,” Abe said at the meeting, held in the Prime Minister’s Office. The death toll has since topped 200, according to a Jiji Press survey. On Sunday, Abe had planned to visit Hiroshima Prefecture, one of the hardest-hit areas, but canceled because of pain in his right hip joint. He said Hachiro Okonogi, minister for disaster management, would go on his behalf instead. “I’ll surely visit Hiroshima on a later date,” Abe said. The prime minister visited Okayama on Wednesday and Ehime on Friday. Both prefectures took heavy damage. On Saturday, the Cabinet designated the torrential rain as an extraordinary disaster to allow people to receive special administrative benefits, such as driver’s license extensions and business permits for restaurants and shops. On Saturday, the start of the three-day Marine Day weekend, volunteers flocked to the region to help with the cleanup despite scorching heat that baked much of the country. The Meteorological Agency issued precautions against heat-related maladies, particularly in the disaster zone. In the meantime, work to restore infrastructure made progress. The Sanyo Expressway, which runs through Okayama and Hiroshima, fully reopened Saturday for the first time in nine days, with the section between the Hiroshima and Kochi interchanges made available for use by ordinary vehicles. According to the Health, Labor and Welfare Ministry, the number of households without water had been reduced to 193,000 from about 260,000 as of noon Saturday, thanks to restoration work in Kure and Etajima in Hiroshima. In Kure, the number stood at 68,000 as of noon but was expected to be cleared completely by Thursday, officials said. Electricity, meanwhile, was fully restored in Okayama and Hiroshima prefectures on Friday, Chugoku Electric Power Co. said. According to the Fire and Disaster Management Agency, 5,200 people were still living in shelters in 16 prefectures as of noon Sunday. 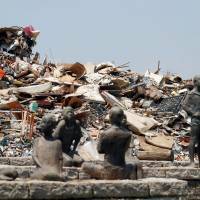 In the heavily flooded Mabicho district in Kurashiki, the number of missing people was reduced to zero as of 8 p.m. Saturday after the Okayama Prefectural Government disclosed their names and sought information on their whereabouts. Many damaged municipalities began accepting volunteers on Saturday. 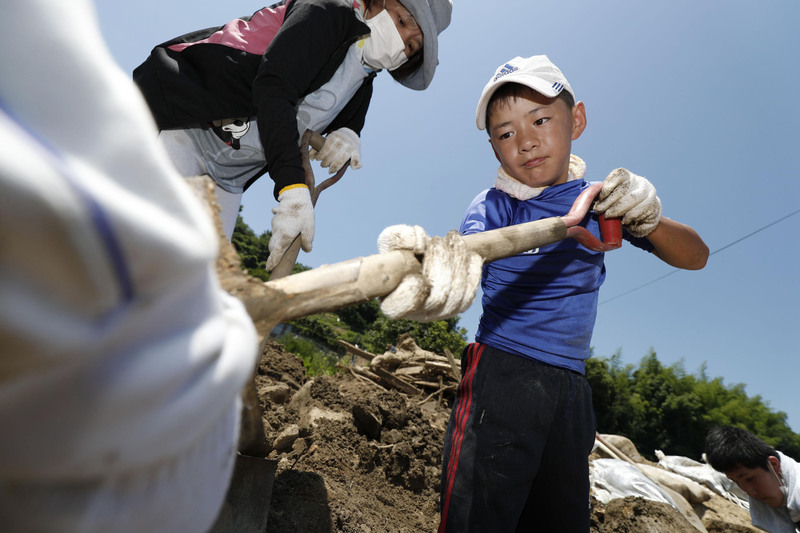 In the Yoshida district in the heavily damaged city of Uwajima in Ehime Prefecture, volunteers were helping residents remove mud and transport furniture. 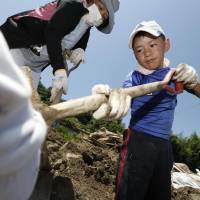 In Hiroshima Prefecture, 17 municipalities have set up offices for volunteers in cooperation with local social welfare councils. In the city itself, an office in Aki Ward saw many turn out to volunteer. Kurashiki initially limited volunteer efforts to residents but began accepting supporters from outside the city on Saturday. They are expected to engage in restoration activities mainly in flood-hit Mabicho. According to the Meteorological Agency, temperatures rose to as high as 34.9 in Kurashiki, 34.8 in Hiroshima’s Asakita Ward and 36.2 in Ozu in Ehime.